One day, my 8th grade art teacher decided to try to teach his class sumi-e, the Japanese art of Ink wash painting. It’s a minimalist style with a long history and subtle philosophy behind it, not exactly the best thing to show a bunch of distracted adolescent kids. He told us to be very conscious of how we painted and what we were painting, but also to try to think about it as little as possible. The brush strokes weren’t supposed to represent the subject at hand—they were supposed to reproduce its essence. None of us were very good at it. Most of the students stopped trying after the first day. In the classroom next door you could hear Bruce Springsteen play on an old boom box while everyone worked on collages. The only sounds coming out of Mr. Ging’s class were his exasperated sighs and disappointed grunts as he inspected one failed painting after another. The game’s sumi-e inspired style goes beyond providing it with surface level appeal and is instead integral to the way you play the game. You play as the mythical Amaterasu, a goddess given the form of a wolf, who must use her celestial brushstrokes to save nature and restore harmony to the world. These brush strokes can fix bridges, cut down enemies, and even create flames. With the simply flick of the analog stick players could have their ideas manifested in the world displayed in front of them. As much as Ōkami felt like a game made rich by the art and culture of Japan, it was also a quintessentially game-y idea. Praise for Ōkami was near universal at the time, but sales were not. The company behind it, Clover Studio, had to fold as a result. The people who worked on the game all went their separate ways. Some of them went on to form PlatinumGames and do great things, while others joined Ignition Entertainment and eventually released El Shaddai: Ascension of the Metatron, a game that looked beautiful and hypnotic from afar but was decidedly less so after several hours. On the eve of its 10th anniversary, it’s hard not to feel like the same problem applies to Ōkami. The game is too long. At 40 hours for the main story alone, the game feels bloated by modern standards. You can earn money in the game, which can be spent on items and weapons, as well as upgrades to your abilities. Except that Ōkami is not a game about combat. The game is at its best when you’re solving puzzles to unlock its mysteries. 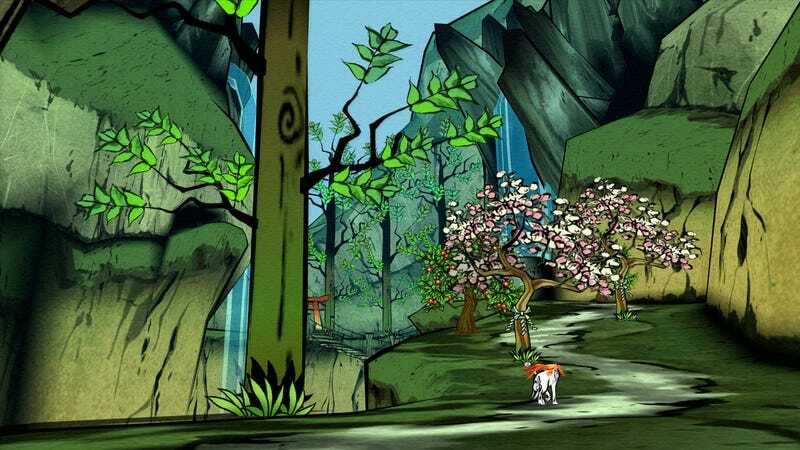 Ten years later, Ōkami feels like a victim of its time, polluted with extraneous mechanics and dry dialogue simply as a way of justifying its artistic endeavors. Almost nobody talks about Ōkami without mentioning The Legend of Zelda, and it’s easy to see why. Too often the game seems intent to chase after the shadow of the latter, parsing its world into dungeons and villages as a result. It didn’t help that Wind Waker had come out only a few years before. The two games could easily be mistaken for siblings, both sharing a certain breezy, cell-shaded aesthetic that was, and is, all too hard to come by. 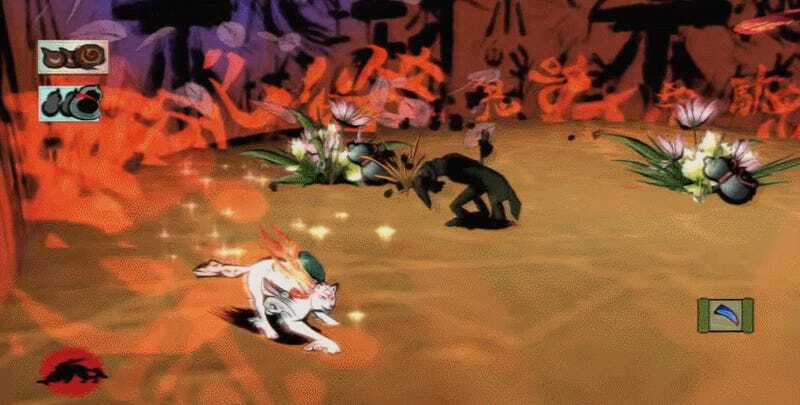 Like a younger brother, Ōkami made the mistake of trying to follow too diligently in the older’s footsteps. Just because Link had been going into dungeons to slay monsters and collecting myriad knick-knacks along the way didn’t mean Amaterasu needed to do the same. It’s understandable, though, why, at the time, Clover Studio felt like she had to. On the third day of Mr. Ging’s class, I opened one of his books to a page filled with pine trees and dipped my brush into some ink before loading the rest with water. For a second I let the brush strokes guide my hand rather than trying to force each one of them to create the lines I thought I wanted. Within seconds I had two evergreens standing side-by-side against the shadow of a mountain. I felt relieved. And so did Mr. Ging. “It’s not terrible,” he said. I remember him framing the piece with a black border and hanging it in the student art show. I don’t think anyone else quite liked it much. It certainly didn’t win any awards. I still have it to this day, and though the memory of what it looked like when the ink first dried has long since faded, I can still make out a tiny glimmer of what made it special. Ōkami is a deeply, perhaps even fatally flawed game. But the reason why I still love it is because of the few things it got so utterly right. Beneath the clutter and decade of baggage there still lies the perfect few minutes of running through the world and making it blossom with the simplest brush strokes.